Hello! Oil continues to drop on various factors including a rise in supplies, OPEC trimming output, and a Hurricane steering away from gulf refineries. 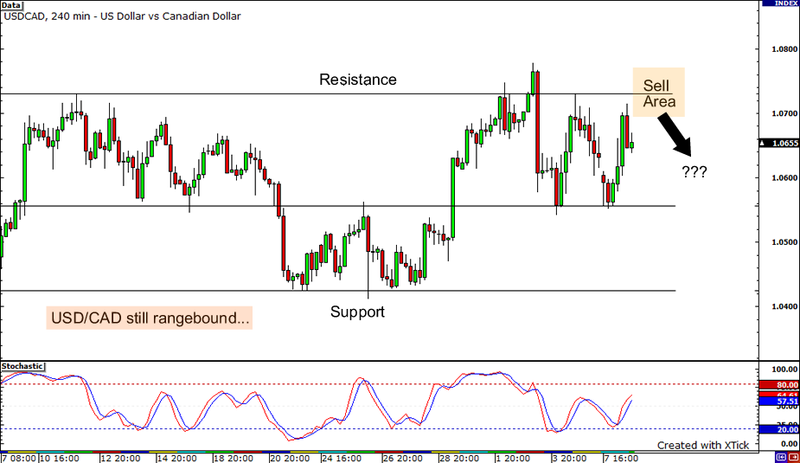 USD/CAD has had trouble moving lower as every attempt to sell has been thwarted at a higher price. I feel buyers are slowing taking control of this pair, and I have decided to close my position out and step back to see how this consolidation pattern will play out. Close open position at market (1.0690). We’re also seeing a ascending triangle pattern on the 4 hour chart. We may see a break on the upside, but the next big sentiment changer for this week may be on if Hurricance Ike grows or changes direction. Stay tuned! The US Dollar rallied against many of the majors today as crude fell further, closing just above $102.00 a barrel. This pushed USD/CAD to the top of the range and triggered my short orders at 1.0700. Nothing to do but wait and see if sellers can hold the top of the range. There’s plenty of news coming out this week fuel further volatility, but I think the price of oil will push the pair one way or another in a definite direction. I will hold for now and update if there is a change in sentiment or adjustments. Hello Everyone! USD/CAD has been behaving a little bit differently than the rest of the majors lately as the pair has been range bound between 1.0450 to 1.0700. Now that we’re near the top of the range, will sellers hold down the top? It’s a pretty simple trade this week as I plan to short the top of the range displayed on the chart. The overall US Dollar rally seems to still be intact thanks to the government take over of Fannie Mae and Freddie Mac, so we may see the pair test the top once again. I also like a short trade on a possible oil rally this week as Hurricane Ike makes its way into the Gulf of Mexico, towards the Gulf refineries. Economically, the US may be the “best of the worst” at the moment, but Canada may be a close second as the two economies are closely linked. Also, recent Canadian data has come in positive was a surprise upside to jobs last week and an increase to building permits today.